We’re in the final countdown to Thanksgiving festivities and I have yet to provide you with an entrée option. Not to worry! 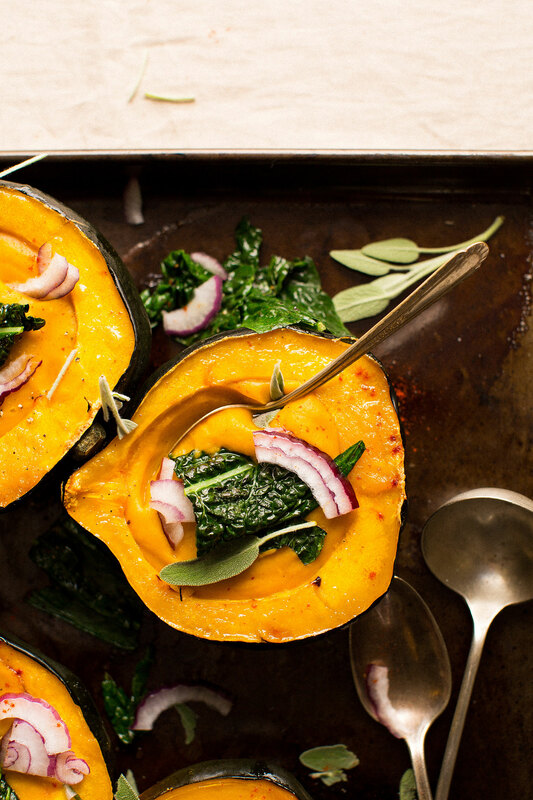 Acorn squash to the rescue. PLUS, I have an exciting announcement! This is the first recipe in a week-long series I’m calling Thanksgiving Week Extravaganza, wherein I post a recipe every day leading up to my Thanksgiving Round-Up on November 23! That’s right: EIGHT recipes that will cover your mains, sides, appetizers, and of course, dessert. Let’s start with this show-stopper of a main, shall we? Last year when pondering a plant-based Thanksgiving entrée my mind immediately went to: What would I actually make and eat on Thanksgiving? And my Sweet Potato Chickpea Thanksgiving Wrap was the answer. This year, I was craving something a little more festive, a little more colorful, and a little more comforting. So I made the easiest, creamy fall soup (ever) and served it in roasted acorn squash “bowls.” The result is a creamy, decadent, nutrient-rich soup that will “wow” guests and leave you feeling all warm and cozy inside. Not only is this soup healthy and delicious, but it’s also easy to make, requiring just 10 basic ingredients you likely have on hand right now, and just 1 1/2 hours to prepare (including roasting acorn squash). The base is a mixture of onion, garlic and your vegetables of choice! I went with a mixture of carrots and butternut squash, but pretty much any winter squash or hearty root vegetable will do here (think pumpkin and beets). Next comes the fun part. Will you add lentils? Mung beans? Sage? Bay leaf? Or go with a curry adaption? You decide. To keep things simple I added a little fresh sage and a bay leaf to infuse plenty of classic fall soup flavor. And for a bit of protein and fiber I added red lentils because they cook quickly (in the soup!) and absorb flavors well. While the soup is coming together roast your squash bowls until golden brown, tender and sweet. However, if squash bowls seem a little too over the top for you, you can totally skip this part and the recipe would become a 1-pot, 45-minute wonder. How cool is that? I think this would make the perfect alternative Thanksgiving entrée or even a side. You could pair this with my Vegan Thanksgiving Wrap, White Bean Kale Salad with Tahini Dresing or Garlicky Kale Salad with Crispy Chickpeas, and a little Sangria for a classy, festive meal. For more Thanksgiving ideas, I’ll be sharing a round-up next week. In the meantime, feel free to check out last year’s! Oh, and don’t forget the Pumpkin Pie or Bars! If you try this soup, let us know! Leave a comment, rate it, and don’t forget to tag a photo #minimalistbaker on Instagram! We’d love to see what you come up with. Cheers, friends! 10-ingredient creamy fall soup with carrots and butternut squash in roasted acorn squash bowls. The ultimate healthy comfort food this fall and winter. Preheat oven to 400 degrees F (204 C) and use a sharp knife to carefully halve acorn squash lengthwise. Do so by inserting the tip of the knife in between two ridges and pressing all the way through, then pushing/rocking the knife to slice through one half. Repeat on the other side. Scoop out seeds with a spoon or ice cream scoop and drizzle with oil and maple syrup - rub with hands to distribute. 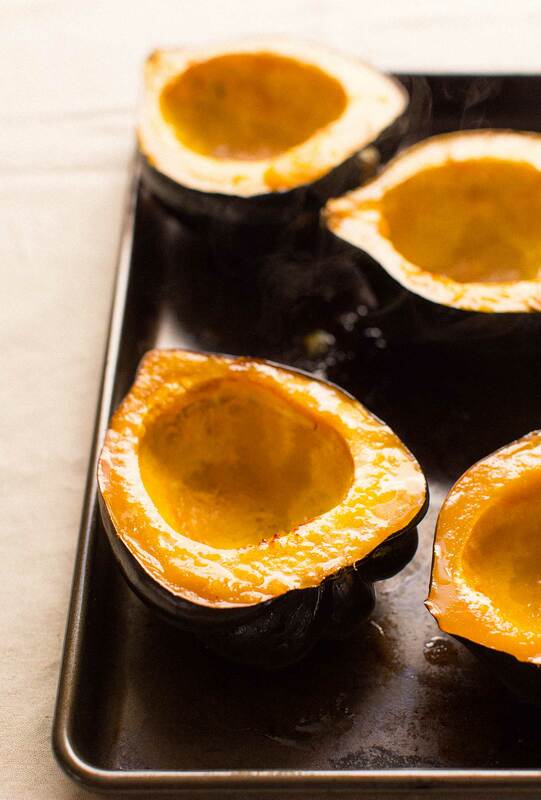 Place squash on a rimmed baking sheet or 9x13 inch baking dish and cover with foil. Bake for 30 minutes covered, then remove foil and bake for 30-40 minutes more, or until squash is fork tender and golden brown on the edges (baking time will vary based on size). Set aside. In the meantime, start soup. Heat a large pot over medium heat. Once hot, add oil, onion, and garlic. Sauté for 4 minutes or until onion is softened, then add sweet potato, squash and/or carrots (I used butternut squash and carrots). Season with a pinch of salt and black pepper and stir. Sauté for 4-5 minutes until vegetables appear slightly softened. Add vegetable broth and herb of choice (I used sage and bay leaf) and bring mixture to a low boil over medium-high heat. If adding lentils, add at this time. 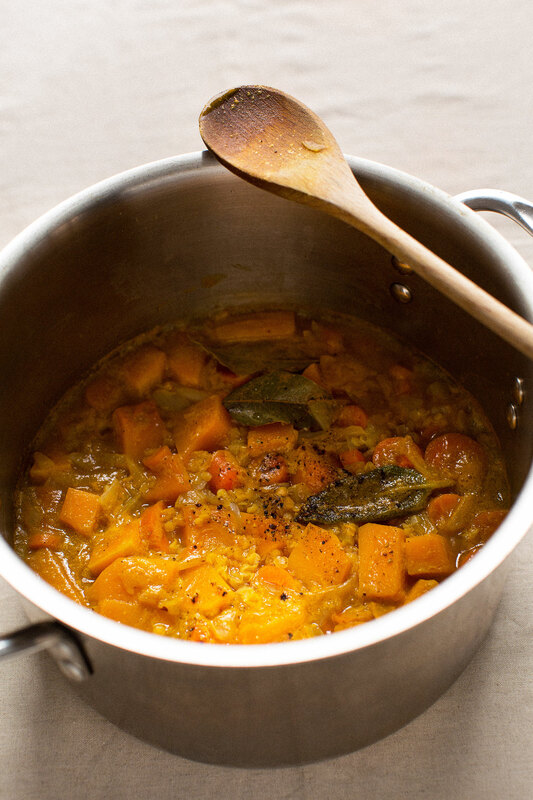 Reduce heat to low and simmer uncovered for 20-30 minutes, or until lentils and vegetables are tender. Then use an immersion blender or transfer to the blender and blend until creamy and smooth. Return to pot if blended in blender. Taste and adjust seasonings as needed, adding salt and pepper for flavor balance, herbs for earthiness, or a little maple syrup or coconut sugar for sweetness (I didn't find it needed it). 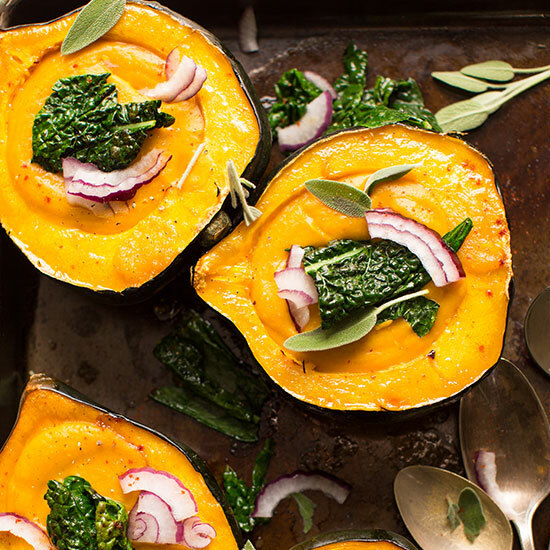 Once acorn squash are baked, divide soup between the squash and garnish with topping(s) of choice - I went for sautéed kale* and red onion, but baked chickpeas, pomegranate, or cornbread (+ cornbread croutons) would work well here. 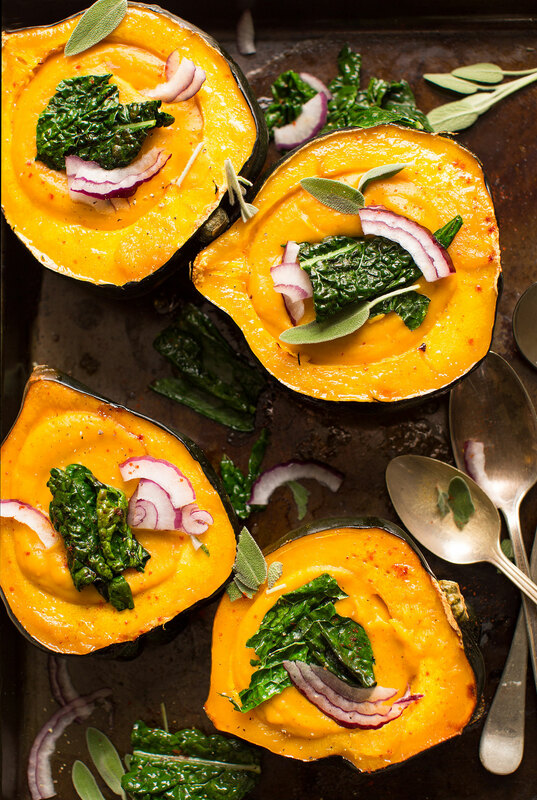 *If you’d rather, you can just skip the acorn squash and use soup bowls, but it’s a festive and delicious touch! *To sauté kale, simply heat a skillet over medium heat. Once hot, add oil of choice (coconut and sesame work well here) and kale. Sprinkle with a bit of salt and pepper and sauté, stirring frequently, until just soft and slightly wilted. Serve over soup. *Acorn squash method from Pioneer Woman. *Nutrition information is a rough estimate for one, 1 1/2 cup serving of soup in 1/2 an acorn squash bowl without added maple syrup, lentils, or any garnishes. If I made just the soup and not the acorn squash. How many bowls would just the soup make and what is a serving size for the soup and the nutrition? Hmm, I’m not sure on the nutrition. But I’d say it’d probably make about 6-7 cups total? Are you including the lentils in the 6 to 7 cups? This looks AMAZING! I am definitely planning on making it for Thanksgiving. Unfortunately they did not have any acorn squash, would kabocha squash work as a substitute? Thanks! Love this recipe!! I served it in a bowl with toasted bread and sautéed Swiss chard, and am in love! Now I know what to eat the rest of fall! We are so glad you enjoyed it, Kate! This was delicious! I made it with a mix of butternut, sweet potato and carrots. I am keeping this on my Fall menu for sure! These were so good! I used mainly butternut squash, some carrot and sweet potato, fresh sage and a bay leaf. I added quite a bit of salt cuz my homemade broth didn’t have much, and a tiny bit of coconut sugar. I garnished with kale chips, red onion and smoked curry roasted chickpeas and everything all together was delicious and hearty. I’ll definitely make this again, and the presentation makes it feel extra special. I’ve been making this soup all fall and winter and it’s delicious. I now use this recipe as a guide and adapt from there- for example, all carrots + dill and red pepper flakes for a spicy carrot soup when I’m not feeling sweet potatoes or squash (or when we get a ton of carrots in our produce box). This recipe is wonderfully adaptable. I’m not vegetarian, so I also use chicken stock sometimes and it works too! 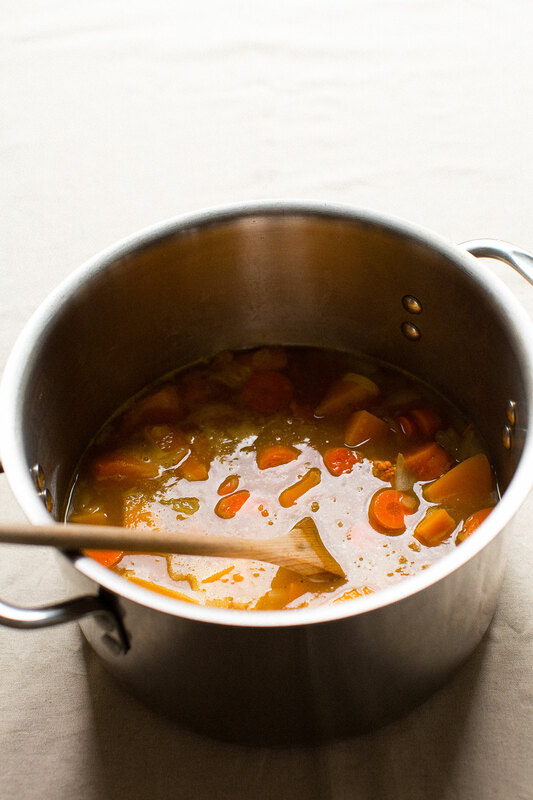 I’ve made this soup many times with most the variations mentioned using a combination of squash, sweet potatoes, or carrots. It’s definitey better in an acorn squash, but when acorn squash isn’t available I’ve made it with a salad on the side. It’s a delicious, filling, and inexpensive meal. Meat-eating husband approves. As a beginner cook and vegan, I found it easy and delicious. Perfect for the winter solstice. This soup was so delicious! I just made it today. My family was excited to experience soup in a squash bowl. I’m soooo excited about the left over soup. Yummy! I made this for Thanksgiving to provide a vegan side, and it was a hit. The soup is the super creamy and not too sweet. I used sweet potato and butternut squash for the soup. I definitely plan to make this often. Can you explain how the outside of the acorn squash can be used for bowls? I love the idea but mine are always either to soft to stand up or destroyed while digging out the inside. Thank you for the great idea. 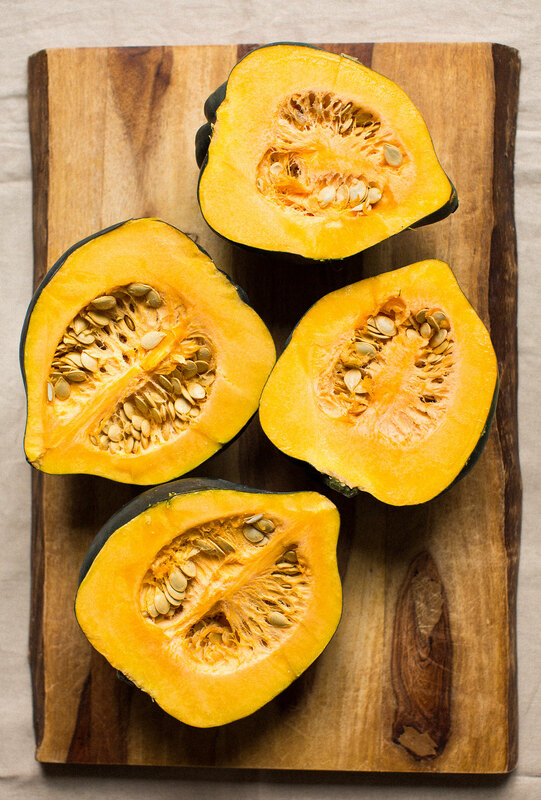 Do you bake the acorn squash skin down or cut side down? Made this delicious soup as part of our Christmas dinner and it received rave reviews! I used sweet potato and carrots, fresh sage and thyme, and served in roasted acorn squash bowls. I was surprised by how savory and hearty this soup tasted. Tip: I use an immersion blender to cream soups right in the pot they’re cooked in, rather than transferring to/from the regular blender–it saves time, mess and extra cleanup. My husband and I adore your recipes, Dana! You have me cooking more often and healthier than ever. Thank you so much for sharing your talent for creating delicious meals ? I made this after Thanksgiving to help us detox, and it was delicious! I don’t think my blender has enough power because the soup came out looking distinctly puke-y with a brown tinge instead of the gorgeous yellow orange that you created. Oh well! I also forgot to remove the bay leaves before blending (ha!) but they cooked long enough that they broke up easily and I didn’t find any big chunks. Lesson learned for next time I puree a soup!! I found this recipe and made it for my family and they loved it! They have since made it a few times themselves and has become a staple to keep in both our fridges in these cold months! 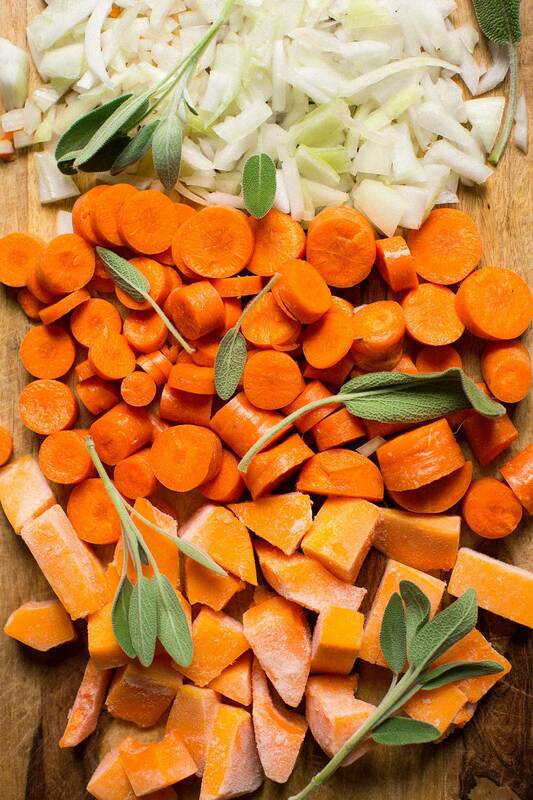 We use just butternut squash and carrots with thyme and sage. It’s absolutely delicious! Can not recommend enough! Enjoyed this thoroughly. I may use Delicata Squash next time; something with a thinner “bowl.” The acorn squash made the dish very filling, and I wasn’t able to get very much in it. The flavor of the soup is excellent though. I used a sweet potato, one carrot and the lentils. It was thicker than I anticipated, and I added a bit more veggie stock to thin in slightly. Will definitely be making this again. And the leftover soup is going to make a nice lunch for work days! Thanks!! This was the kind of soup that you savor the flavor of every single bite. I used a butternut squash, two carrots, and a sweet potato. No sugar/syrup needed. And used fresh thyme and two bay leafs. And low sodium veggie broth from Sprouts. It was perfect served in the acorn squash bowl. I loved this recipe because it still had a creaminess to the soup without any dairy. I made some rustic no knead bread for the side and it was a delicious addition to dip into the soup. Oh, and I added the Red Lentils. So good. This was so good. (I much prefer blended soups to chunky.) I doubled the recipe and froze it in muffin tins. I used all three veggies and the lentils (that increased the simmer time), plus both fresh sage and a bay leaf. The only real modification I made (aside from skipping the squash bowls) was adding a small amount of apple cider vinegar to give it more depth of flavor. The sweetness was perfect without adding anything extra. If you need to blend in multiple batches, scoop out the lentils from the bottom or you’ll end up with one batch that’s mostly lentil soup (and the flavors won’t match). Did I mention how much I love this soup? Thanks Dana, this was delicious! I did a mix of carrot and butternut squash and thought it was sweet enough without the addition of maple syrup. I did add a bit of yellow curry powder too, actually by accident because I had two recipes open, and thought it was a great addition. Am now inspired and will be serving my black bean and butternut squash chili in a roasted pumpkin for Thanksgiving dinner! Love your recipes! Wondering if any part of this Creamy Fall Soup in the Acorn Squash Bowls can be made a day ahead to save a little time and effort on the holiday. This is going on our Thanksgiving menu! Yum! Wow, this recipe sounds great! I’m a newly Vegan due to health reason. I have been struggling to accommodate my eclectic pallet and I think this recipe will be a nice addition to some of the recipes I’ve been collecting. I’m getting married next September and need recipes that could also accommodate the non-vegan taste pallet. Do you think this could possibly be a good addition to a wedding meal list? I do! I think that would be amazing. Good luck! Do you pull the herbs out before blending? This is such a good idea! Great Thanksgiving recipe!! These are just gorgeous. Some of the prettiest soup presentation I’ve ever seen! Looks amazing! Definitely will be making this for Thanksgiving. Honestly, I would pay money to get those recipes TODAY vs waiting the next 7 days to get recipes! Particularly a main course turkey substitute! Thank you for the amazing flavors and inspiration! Just made the coconut curry ramen other nite and the leftover broth has been rocking my world. I plan to use it again as a stock in other meals. About this beautiful recipe, if I use the beets for the soup would you suggest the other recipe to follow or continue with lentils etc just use beets as veg? I hope my question makes sense? I appreciate all that you do! Hi Resa! I’m not sure I understand what you’re saying – sorry! Hey, Dana I believe Resa is asking if she should use all the other ingredients if she decided to go with beets instead of the carrots and butternut squash. and if the beets will be good with the lentils? or should she just use beets as veg without the other ingredients? if not i do apologize. Oh, ha! Thanks for clarifying. Yeah! I do. Use this recipe for inspiration. 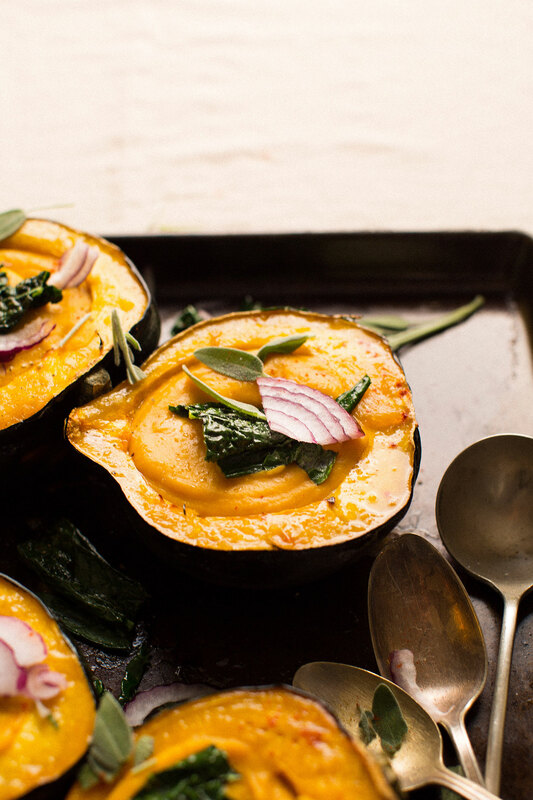 What a fun use of acorn squash! Love it! I can’t wait to try this! I’ve stuffed acorn squash before but never used soup. Does the nutritional information include the 1 Cup of red lentils? Thanks! Love your recipes and your book, too?